I pinned this meatloaf awhile back and have made it, wrapped it, and put it in the freezer to pull out later (most likely for a Sunday lunch). 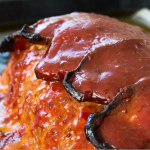 Titled Best Meatloaf Recipe, it came from norecipes.com and looks absolutely scrumptious. Normally $5.99 a pound, the BOGO price is $3.00 per pound. The bacon sale price is also $3.00 per pound. 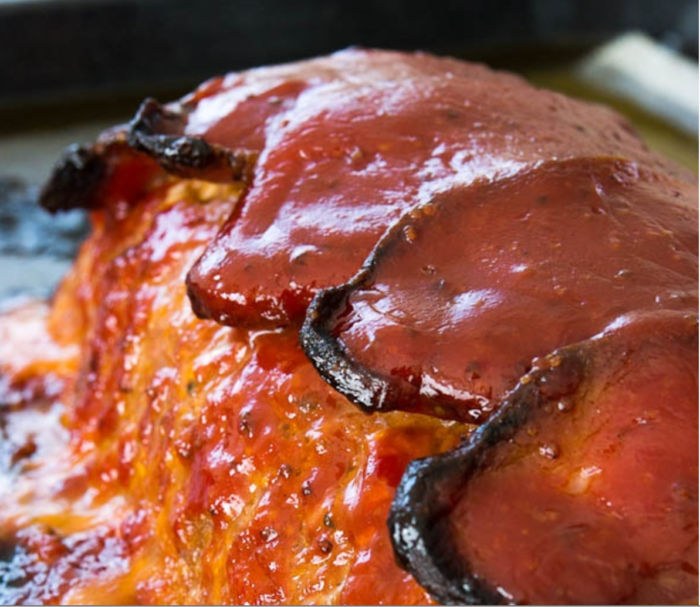 So right off the bat this meatloaf can be made for $6.00 less if buying the BOGO items. FYI: The BOGO deals are Tuesdays only, and sometimes the popular sale items run out late in the day. I’ve had this happen and always try to get items I really want in the morning or early afternoon. 2. Add the ground beef, ground pork, onion, garlic, panko, Gruyere, egg, milk, tomato paste, Worcestershire sauce, honey, soy sauce, pimentÃ³n, salt, pepper and thyme to a bowl. Put on latex gloves, and use your hands to knead the mixture until ingredients are dispersed, being careful not to knead too long (meat will toughen). 3. Line bottom of broiler pan with aluminum foil. Spray the top of the broiler pan with cooking spray to lessen sticking by the meatloaf. Shape the meat mixture into a loaf. Top with the bacon, slightly overlapping each slice. 4. Bake the meatloaf for 30 minutes. While the meatloaf is in the oven, make the glaze by mixing the ketchup, honey, Worcestershire sauce, and mustard in a small bowl to combine. 5. Remove the meatloaf from the oven and cover with the glaze. Return the meatloaf to the oven and bake for another 20-30 minutes, or until an instand read thermometer reads 165 degrees. 6. Remove the meatloaf from the oven, and allow it to rest for at least 15 minutes before cutting into it. Serve with mashed potatoes and green beans.